Being aware of your environmental footprint is important even when you’re on vacation. Toronto has a variety of eco-conscious accommodations that range from luxury hotels to cozy hostels. If you’re interested in exploring more eco-friendly accommodations in Toronto and beyond, check out Green Key Global, an international eco-rating program that indicates when hotels are working to improve their environmental performance. If there’s a winner of the greenest accommodations in Toronto, it’s The Planet Traveler. So far, it’s the only spot in Toronto that has eco-awareness as their driving mission. As the only hostel on this list, it’s also the most budget-friendly. Situated in a refurbished century-old building on College Street in the downtown area, it’s a spacious hostel that includes a lounge and rooftop bar. Their green technology is hands-on, allowing guests to feel the heat being reclaimed through copper pipes and to check the building’s electricity production on digital readouts throughout the hostel. Planet Traveler was also Toronto’s first joint geothermal project, and rooftop solar panels heat the building’s water. They also incorporate photovoltaic electricity. The Old Mill Toronto lies in the city’s west end, in Etobicoke. 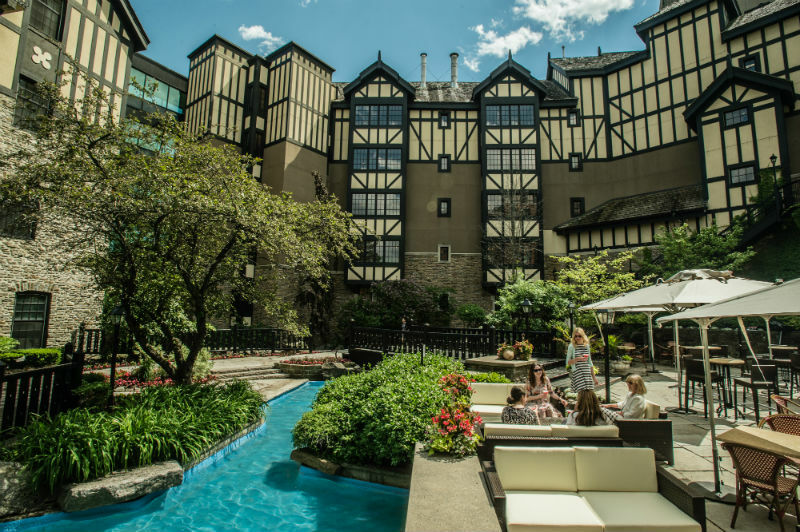 Situated on a picturesque slope at the banks of the Humber River, the Old Mill has implemented a number of green initiatives that have given it a 4/5 Green Key score. Some of these initiatives include eliminating pesticides from the extensive gardens that surround the inn, replacing traditional toilet tanks with low consumption flush tanks, reducing the use of environmentally damaging products like bleach and drain openers, and more. Pantages is minutes from Yonge-Dundas Square and the Eaton Centre, right in the heart of Toronto’s downtown area. This four-star hotel also gets a Level 4 (out of 5) on the Green Key scale. All rooms are suites, and the hotel has an artful, urban atmosphere. Their Rainforest Relaxation Room includes a whirlpool, sauna, and steam room. The hotel is also within walking distance of multiple theaters, museums, Nathan Phillips Square, and St. Lawrence Market, and some of Toronto’s hippest neighborhoods. With the slogan “luxury need not cost the earth,” the Shangri-La corporation is involved in a number of global sustainability projects. Their environmental program, called Sanctuary, was launched in 2010, and their Toronto location achieves a 5/5 Green Key score. The hotel is centrally located and within walking distance of the Art Gallery of Ontario, the theater district, Yonge Street, and more. The Chelsea is a family-friendly hotel on Gerrard Street West that scores a 4/5 on the Green Key scale. All of the must-see attractions in the city are easily accessible from the hotel, which with 1,590 rooms is Canada’s largest. Their social responsibility program includes incorporating a hydroponic wall in the lobby, using only 100% non-toxic cleaning materials, and phasing out plastic water bottles from all guest rooms. By their estimation, this change alone will contribute to a reduction of four million fewer bottles feeding into the waste stream annually. You can read a list of their environmental compliances here.